Focus in Indian Telecom now needs to shift from infrastructure creation and network rollout towards reuse of resources and innovation. The concept of tower sharing that began four to five years ago was a great milestone. It showed operators realising there is more value in sharing assets than in keeping them to one’s self. Therefore, Instead of penalising operators for sharing scarce resources, as the drive against “illegal 3G roaming” indicates, the regulator should encourage all forms of asset sharing, including spectrum, provided consumers aren’t being short-changed. The legislators also need a MVNO policy to allow MVNOs(virtual operators who lease the infrastructure from other operators) into the market eco-system. This enables idle assets become economically productive platforms for consumer innovation. Once this freedom is established, the wholesale market will naturally begin to evolve. Players like Lightsquared, a company that is building a $7 billion wholesale-only 4G network across the USA, could make eminent sense in broadband-hungry India. Wholesale should be very seriously encouraged. In fact, for BSNL it could be a brilliant option, given its huge strength in infrastructure but almost nothing on the retail side. The government needs to Encourage mergers and acquistions, by doing away with all restrictions on spectrum held and increasing the combined market share level in consultation with the Competition Commission of India (CCI). Playing the regulator by imposing artificial constraints on mergers, prevents a free play of market forces. When it comes to mergers, fears of cartelisation or monopolisation are almost always overblown. The concept of regulators determining the number of operators is itself outdated. Regulating the telecom sector requires certain expertise which a government ministry cannot be expected to have. Today we have technological and economic solutions like spectrum and network sharing which should dictate the sectoral dynamics. In fact, the concept of an operator being an end-to-end entity needs to be rethought. They can be just a customer facing entity. Regulators should become innovative and forward looking, and behave like economists. Unfortunately, many dont think and cannot understand and comprehend their basic tasks and responsibilities. Regulators today are still stuck in the pre-91 Hindu-rate-of-growth babudom dominated decision taking authoritarian culture. The market and the economy has evolved multifold and should be treated as a play of multiple market forces where the rule of regulator is to set a level playing field and safeguard customer interest against cartelization. Global Tablet sales to end users reached 67.0 million units in 2011 and is expected to reach 248.6 million units by the end of 2015, growing at a CAGR of 38.8% from 2011 to 2015. Asia – Pacific (including Japan) is expected to enjoy the highest share of overall global shipments and end user sales of Tablets at 36.1% and 35.3% respectively in 2015. In 2011, Smartphone sales to end users reached 469.9 million units, registering a growth of 66.7% over 2010 sales of 282.0 million units. The Smartphone sales to end user are expected to reach 1,048.0 million units by 2015 with Asia – Pacific accounting for the largest market share at 39.5%. Asia Pacific is also expected to enjoy the highest growth rate at a CAGR of 36.3% from 2010 to 2015. 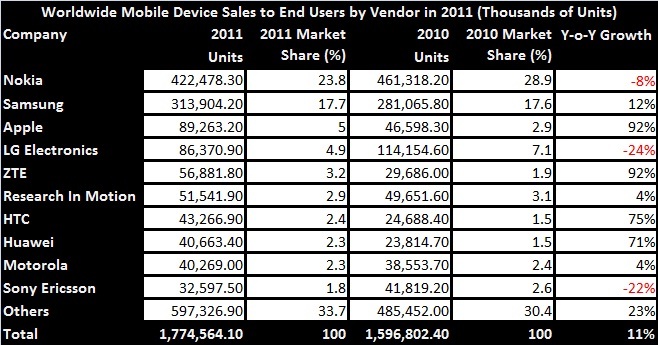 The Tablet sales to end user increased by 276.5% in 2011 from 17.8 million units sold to end users in 2010. The growth in sales is largely attributed to consumer response to Apple’s iPad 2, Samsung’s Galaxy Tab & Galaxy Tab 2 and Amazon’s Kindle Fire Tab. Launched in November 2011, Amazon’s USD 199 Tab; Kindle Fire, had incredible response among consumers and managed around 3.5 million units sales in last 45 days of the year 2011. Globally, the installed base of Tablet devices have reached 81.2 million units in 2011 and expected to reach 388.8 million units by the end of 2015. Consumer segment is the largest adopter of media Tablet devices, while business users prefer communicators. Media Tablets is expected to remain the largest Tablet device segment with over 60% sales share in 2015, while hybrid segment will account for more than one-fourth of the sales in the same year. Smartphones are becoming more ubiquitous communication devices among all user segments with almost 75% of smartphone consumer (individual) subscriber use their smartphones for personal as well as business purposes. Moreover, 65% of global SMBs now allow employee owned smartphone for official use. This acted as the strong booster for Smartphone market growth. The smartphones market grew by 66.7% during last year and sales reached to 469.9 million units in 2011. 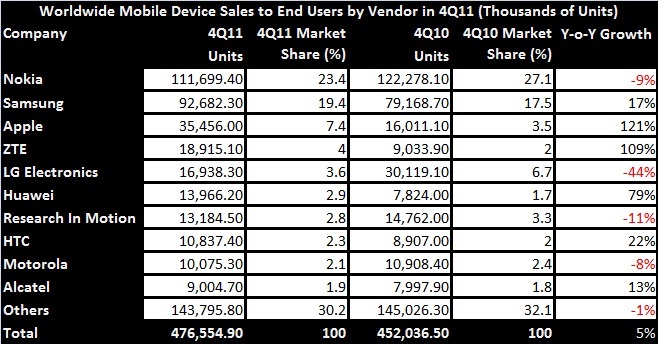 Smartphone sale in 4Q2011 alone crossed the combined sales of all the four quarters of 2008. This leap in sales came on account of consumer as well as enterprise adoption of iPhone 4S, which posted 36.1 million units sales to end user in Q42011 alone. In a shock ruling ten days ago, the Supreme Court cancelled 122 mobile phone licences that had been deceitfully awarded in 2008. The ruling sent the telecom industry into chaos, confirmed dreadful corruption in the government’s decision-making process, and damaged the reputation of our nation in the eyes of the world—especially foreign investors. There was much euphoria inside the country, however, for justice had seemingly been served. 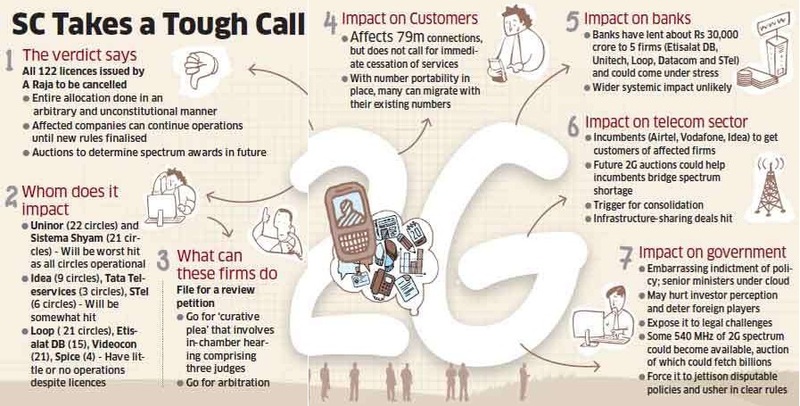 The Supreme Court also instructed the telecom regulator (TRAI) to auction the illegally gained 2G spectrum, as it was done in the case of 3G spectrum. “While transferring or alienating natural resources, the state is duty bound to adopt the method of auction by giving wide publicity so that all eligible persons can participate,” said the court judgment. Auctions are certainly a better way to allocate a scare resource than first come first served, but what former telecom minister A Raja did was, of course, preposterous — he subverted the “first come first serve” policy by changing rules mid-way; he allocated spectrum out-of-turn in a non-transparent manner, and that too at 2001 prices, thus creating the biggest corruption scandal in India’s history. But is auctioning the best way to allocate radio spectrum? Although it is scarce, should it be used as a money-making device by government? Since water is scarce, should it be auctioned? No. The risk in an auction is that “animal spirits” of entrepreneurs forces them to bid very high, which is then reflected in high tariffs, and this forces the poor out of the market. Thirty-one countries have used spectrum auctions and many have regretted it for this reason. India is, perhaps, the world’s most successful telecom market with the lowest tariffs in the world. Hence, it has the highest number of subscribers who are poor. The credit for this goes to the previous government which had the courage to change policy from high license fees to revenue sharing between the telephone company and the government. If the state had been “duty bound to hold an auction”, cell phones would not have reached the poor. In the ideal world, radio spectrum would be like sunshine which is not owned by anyone or any government but everyone enjoys it without any cost. But unlike sunshine, spectrum is finite and hence it has been historically controlled by governments. It is widely accepted that government allocation is inefficient and leads to corruption. Ronald Coase, the Nobel Prize winner, exploded the myth long ago that governments should control spectrum to prevent airwave chaos. Today many experts think of spectrum as a common grazing ground around a village, which is open to everyone to use freely. They claim that new spectrum-sharing technologies allow a virtually unlimited number of persons to use it without causing each other interference-this eliminates the need for either property rights or government control. This is why the United States has gone ahead and designated a 50 MHz block of spectrum in the 3650 MHz band as a “commons”. If the spectrum were a “commons” nobody would own it nor need to auction it. A telecom company would merely register with an authority, which would assign it a spectrum frequency for its use. When the company reached the limit of its spectrum, the authority would release it some more. Just as a villager pays a nominal tax for maintaining the commons, depending on how many cattle he grazes, each cell phone subscriber would pay a nominal fee, say a paisa per minute, towards upkeep of the spectrum. It would be form a part of the monthly bill, and transferred by the phone company to the authority. Just as a village needs rules to prevent over-grazing, there would be rules in maintaining spectrum to avoid a “tragedy of the commons”. The rules would be transparent, monitored in real time, and no one would be able to corner the spectrum. Unfortunately, the Supreme Court judgment has come out so heavily prescriptive in favour of auctions that future governments in India will be shy to adopt a better alternative. Technology is developing very rapidly and soon the world will be ready for an “open spectrum” regime, but the court’s inflexible judgment will inhibit the Indian government in doing the right thing. A pity! Worldwide smartphone sales to end users soared to 149 million units in the fourth quarter of 2011, a 47.3 per cent increase from the fourth quarter of 2010. Total smartphone sales in 2011 reached 472 million units and accounted for 31 percent of all mobile devices sales, up 58 percent from 2010. Apple became the third-largest mobile phone vendor in the world, overtaking LG and the world’s top smartphone vendor, with a market share of 23.8 percent in the fourth quarter of 2011, and the top smartphone vendor for 2011 as a whole, with a 19 percent market share. Worldwide mobile device sales to end users totaled 476.5 million units in the fourth quarter of 2011, a 5.4 percent increase from the same period in 2010. In 2011 as a whole, end users bought 1.8 billion units, an 11.1 percent increase from 2010. Bad governance and regulation in India is an equal opportunity offender. UPA’s errors of omissions & alleged commissions beginning 2004, has all but ruined one of the best stories of the Indian economy—telecom. While new entrants struggle for their very right to exist in India, older incumbents are currently staring at the prospect of being “retroactively” charged an estimated Rs. 37,000 crore each for 10 years-worth of “excess spectrum” held by them. State-owned Telcos are being progressively run to the ground, earnest private operators have been waiting for start-up spectrum in key markets for any number of years. When a foolhardy new entrant pops up, and when it bid $1 billion for 4G licenses in four lucrative markets, its application was rejected for thoroughly frivolous reasons. A mish-mash of secretive and uninformed regulators—the ministry of Telecom, TRAI, Department of Telecom, TDSAT—work at cross-purposes with each other. Operators and other stakeholders come to know of regulations via frequent “leaks” to the media, in most cases traced back to unauthorised photocopies of official documents that are palmed off and sold by junior staffers. The phrase “regulation through photocopy” would not be out of place, most stakeholders agree in private. With nearly 900 million subscribers across seven to 15 operators (depending on whether you include the ones whose licenses were cancelled), regulators ought to understand Indian Telecom is no longer in its infancy. The whole idea of prescribing how an eighth, ninth or tenth operator should roll out their networks doesn’t make sense today. Consumers need service competition, not multiplicity of infrastructure. There is a strong belief that this logic of introducing many more operators in each regional market may not be consistent with how wireless telecom has evolved across the world. According to the credit rating agency CARE’s research, on an average there were 15 players (both GSM and CDMA) in a telecom circle in India as compared to three in Singapore, three in China, four in Mexico and five in the US. Out of the total 122 cancelled licences, 39 licence areas (about 32 percent) are under-utilised as these many operators did not even have 1,000 subscribers in many circles as of December 2011, implying the services were not fully rolled out. And here’s a telling comment on the state of the industry: After the cancellation of licences, average number of operators will come down to around nine to 10. This indicates that further entry of operators beyond four or five does not significantly increase the competitiveness of the market. And what do the fringe guys have to show for their efforts? A $2 billion pan India network without any subscribers!